Well-behaved [minorities] seldom make history. This spring has been a total whirlwind for me, on both professional and personal levels. Exhibit A: On March 2nd, I was sitting in an alumni leadership meeting at my alma mater, being briefed on the latest in a string of racist, homophobic, anti-semitic attacks on campus, and the actions the administration had been taking to track down the culprits since the (mostly, but not all, verbal / written) attacks began in early February. Two days later, on March 4th, I woke up to find my Twitter feed blowing up with the news that a person wearing a white hooded robe resembling KKK regalia was seen near a designated campus safe space for students of African heritage in the early morning hours. As a result, all classes were cancelled, a range of educational events were planned, and a convocation / community gathering originally scheduled for later in the week was moved up to take place that morning. Exhibit B: In mid-March, I returned to work from an out-of-state conference to discover my department would be affected by some (re)organizational shifts, and that the changes were going into effect pretty much immediately. It took us a while to define what those shifts would mean in terms of our workloads and the various responsibilities we all have in the new structure. Basically though, like what happens in most reorgs, for me it meant more and different work. In both of these cases I took on some additional leadership tasks because I was asked to do so. In Oberlin’s case, this meant writing a short letter on behalf of the minority group I represent, and then expanding on that letter in the campus newspaper a couple of weeks later (alumni leadership members take turns submitting letters to the campus newspaper; it just so happened that it was my turn and the recent events seemed like the only appropriate topic). … which brings me back to what’s been happening at Oberlin. The College has a progressive history, but that doesn’t excuse the racism, sexism, Islamophobia, homophobia, anti-semitism, and other forms of hate and discrimination practiced (consciously or subconsciously) by the institution and its community members, including myself. Despite the microaggressions and marginalization I experience every day thanks to my gender and gender expression (both real and perceived), I benefit a great deal from racial, socioeconomic, and ability-based privilege (among others), including the situational and relative kind. I sometimes fail to call out bigotry when I see or hear it happening to other people; I also sometimes actively participate in hate and discrimination. I’m not okay with that. I’ve never been okay with that. So what changed — why has this particular season been so exhausting? It started with a radical action by current students during a live televised interview. Brooke Baldwin, CNN anchor: Mr Krislov, how in the world, this last month, these multiple incidents now, over a dozen incidents of hate … how are students, how are faculty reacting on your tight-knit campus in Ohio? 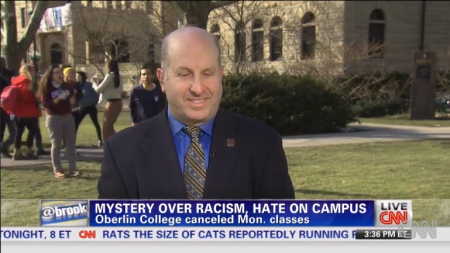 Marvin Krislov, President of Oberlin College: Well, I think that yesterday was a very important day for us, that it was an educational moment where we took time out from our normal classes to have special classes and special discussions about how we’re feeling, but also the role of race and religion and other issues about the way we relate to each other. And I think that, what I’m hearing from students and faculty and staff today is that they feel very inspired. They feel inspired because this institution has the courage to talk about these issues and to confront concerns, and that that is part of our educational mission. BB: Why, with all of these incidents happening over the course of a month … why yesterday be the first day that classes are cancelled? As I realized later, after I’d spent a couple of days on my high horse: if we want to talk about the importance of kindness, dignity, and respect, we need to take a wider view of the situation. Students of color and other marginalized groups affected by hate-related incidents organized a series of community-building events that stressed solidarity, and were relatively patient and respectful for a month while then investigation was ongoing. On March 4th, the situation immediately escalated for students of color; they lobbied the administration to cancel classes for a special campus-wide Day of Solidarity, but only got it after threatening large-scale civil disobedience. When the media came to town over the next couple of days, the College promoted a false narrative, or at a minimum failed to correct a false narrative, that effectively erased the involvement of students of color in the planning and leading the Day of Solidarity. A small group of students publicly raised their voices in protest, and were quickly scolded by a large group of their peers, who demanded a public and formal apology. That petition and demand was later retracted, and other voices came forward to support the protest, but not before almost 200 people signed in support, and not before the petition hijacked attention from the real issue at hand: that a significant portion of the student body was not just embarrassed but afraid for their lives, and justifiably so. Who was being unkind, undignified, and disrespectful now? Me, for one. And so the unpacking began. I’m not sure why it took this particular series of events for me to truly understand how little I know about the experiences of racial minorities in this country, or to recognize how respectability is a function of privilege. It’s embarrassing and shameful for me, certainly. I’m trying to spend my time and energy thinking not about how ignorant I’ve been, though, as that is a useless exercise that benefits no one. Instead I’m trying to spend that time educating myself about the ways in which I perpetuate and participate in bigotry, either through my actions or inactions, and how to eradicate those behaviors from my daily habits. What in the world does any of this have to do with edtech? Part of my self-education this month has been seeking out people who can speak about issues of racism, classism, heteronormativism, ableism, etc in a frank and intelligent way, and who can also do so from a perspective I don’t share. A quick audit of my RSS and Twitter feeds was pretty appalling; the Bay Area has helped me understand the importance of active and intentional inclusion, and yet my digital space has historically been pretty homogenous. This is especially true of the edtech sphere I have created for myself. To be clear: I truly respect, value, and enjoying engaging with the thoughts, experience, and opinions of my current sphere. I’m not suggesting that I always agree with, or have nothing to learn from, people who have a similar perspective to mine. My point is just that I also have a lot to learn from people who do NOT look or sound like me, don’t come from the same background, don’t work in the same kind of institution, don’t have the same abilities/disabilities/learning needs/etc. And I have been doing a really terrible job of seeking out that diversity, of translating the theoretical importance of diversity into action. How does constructing one’s digital identity / reclaiming one’s data work for a student whose computer usage is limited to one or two hours a day on a computer at the public library? What processes do we need to put into place to ensure all course websites are fully accessible to all visitors? How do I build diversity into all of the conversations I have regarding education and technology, without resorting to tokenism? None of these issues are easy, and doing a good job will mean constantly confronting my own ignorance and bigotry in the process. It has been and will continue to be exhausting. I will have to constantly remind myself that allyship is a process, not a fixed state of being. I will have to learn to be okay with ruffling feathers. I will likely have to make decisions between doing the right thing, and doing the respectful thing. If what I ultimately want is to change the world, to empty the sea with my teaspoon … I need to remember that being a well-behaved minority is not my goal.